What is the best carpet cleaner rental? 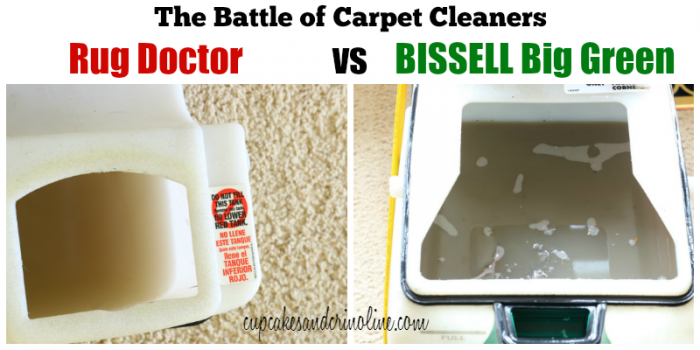 In this post, I compare Rug Doctor vs Bissell with side-by-side photo results. 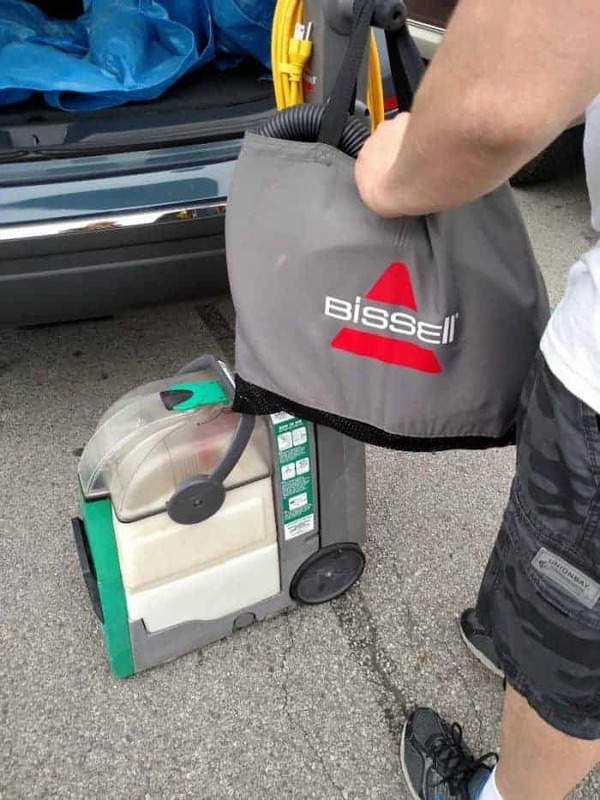 The Bissell Big Green was a Lowe’s carpet cleaner rental. Info in the post will direct you to a carpet cleaner rental near you as well as the option to purchase the recommended unit. Carpet cleaning is one of those tasks that sometimes I put off. Like, for years. I know it’s not right but I am not thrilled about having a professional company clean my carpets. I’ve tried it and the results were less than what I expected plus it was expensive. I have my own carpet cleaner, a Bissell ProHeat 2x. It’s a home unit that I used to use all the time when we had our dog. When she was sick she, unfortunately, had a lot of accidents and the home unit was a sanity saver but as much as I like my home carpet cleaner, I knew that the professional unit would probably do a more thorough job so I decided to not only rent one but rent the top two and determine which of the two is the best rental carpet cleaner. 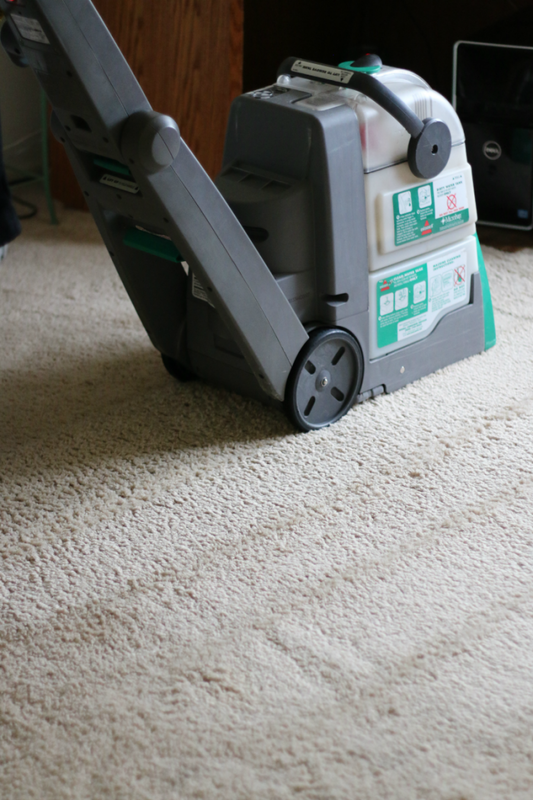 In order to answer the question of which machine did a better job, I rented a Bissell Big Green Professional Carpet Cleaner Machine, 86T3, and a Rug Doctor and I’ve done a side-by-side test for you. Below are my results along with my recommendations. Both units folded up easily and fit into the back of my Nissan Murano crossover. They also fit into the trunk of my son’s car, a Toyota Corolla. 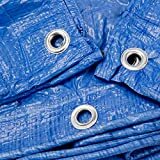 I do recommend you use a tarp or other similar item to protect your car as there was some minor drippage from both units. Once home, we started our test. 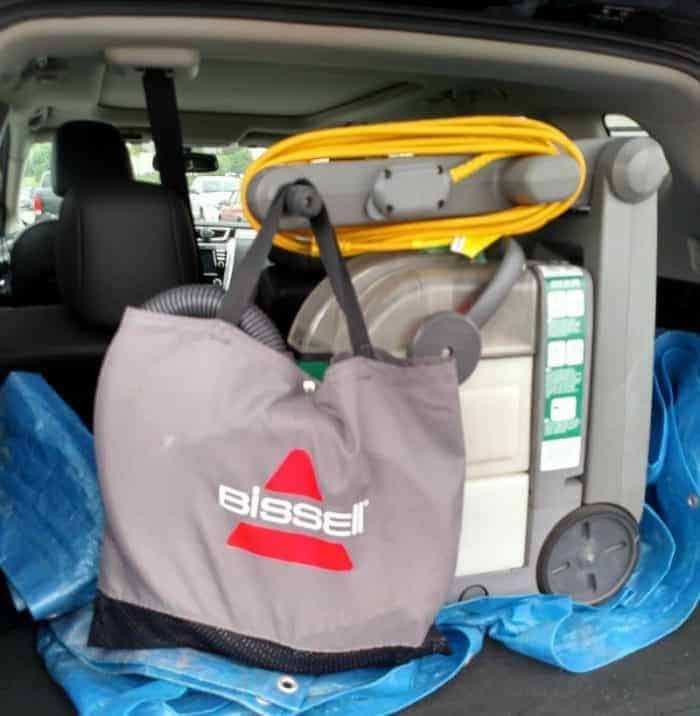 The BISSELL Rental was easy to fill and prepare for use. The machine is in four parts. The front section has three components. The bottom plastic area is where you’ll add water and the cleaning solution. It easily lifts off of the machine platform and fit into my laundry tub for filling. It also easily fit into one side of my kitchen sink so if a laundry tub is not available, a kitchen sink or bathtub is a viable alternative. I added hot water, two caps of cleaning solution (per the instructions on the bottle). I placed the water reservoir on the bottom of the machine, snapped the dirty water receptacle on top of that and then added the lid. Everything fit together very easily. The Rug Doctor was a little more cumbersome to fill up. I had to mix a gallon of hot water and the cleaning solution in a bucket and then pour the bucket into the bottom of the unit. Both were plugged in and the cleaning began. The BISSELL Rental had a much longer plug which was a real bonus. 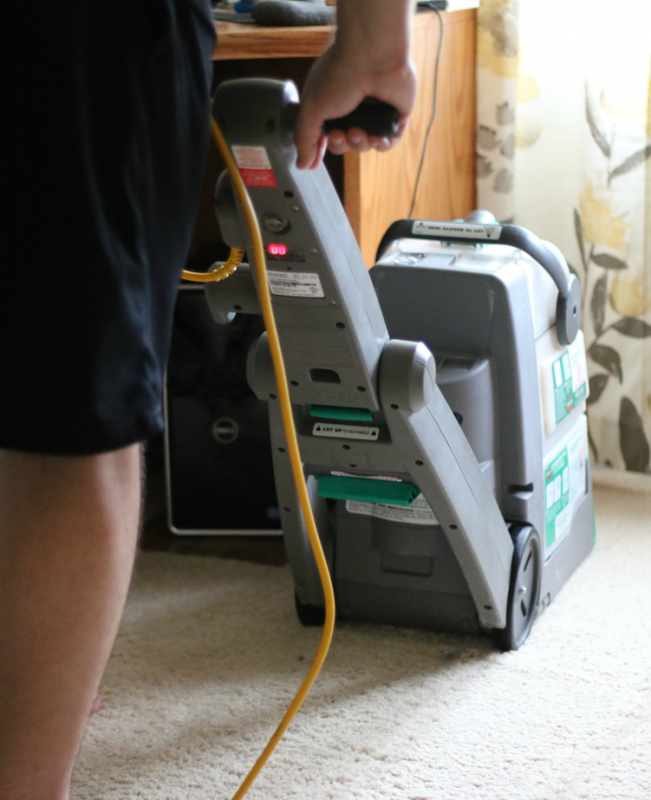 The longer plug meant fewer cleaning stoppages and the ability to cover wider areas of carpeting. 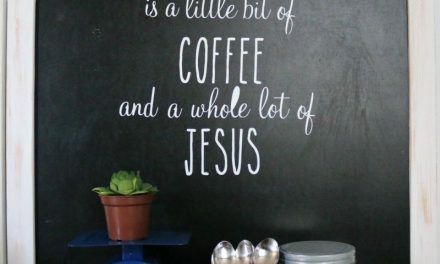 My husband did almost all of the actual cleaning – I supervised 😉 and he was able to leave the BISSELL plugged into a receptacle in the living room while he cleaned it (the living room), and almost all of the hallway. The Rug Doctor had a very short cord which was not convenient. When moving from room to room it had to be unplugged and another plug found. While this was not a major issue, we preferred the longer cord on the Bissell. Can be pulled and pushed. This is a huge plus as it feels like a more natural process similar to vacuuming. The handle is a bit higher and it was easy for my husband (6 foot 5 inches tall), my middle son (5 foot 7 inches tall) and myself (5 foot 2 inches tall) to use. We all were able to comfortably push and pull the machine without stretching or being hunched over. Can only clean while pulling slowly backward. The handle is small, lower to the ground, and not very comfortable for taller users. I was fine because of my short stature but it was a bit uncomfortable for my husband as he had to hunch over. 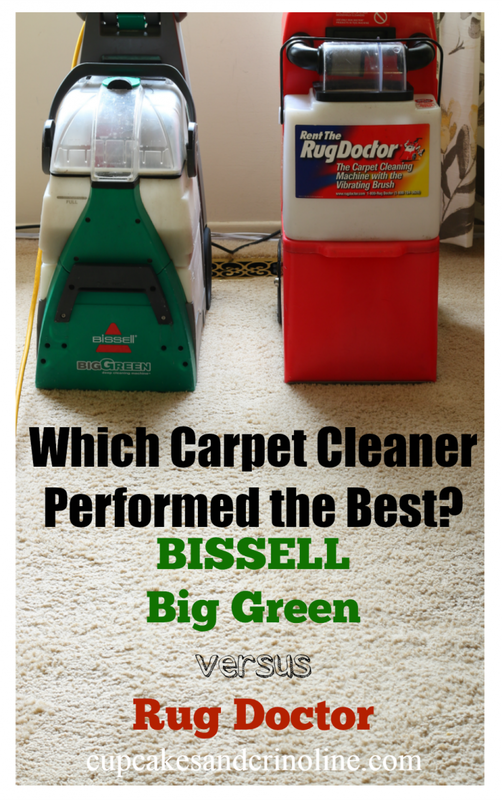 Both pulled ample amounts of dirt from the carpeting but the BISSELL Big Green definitely pulled the most…more than I expected (gross). 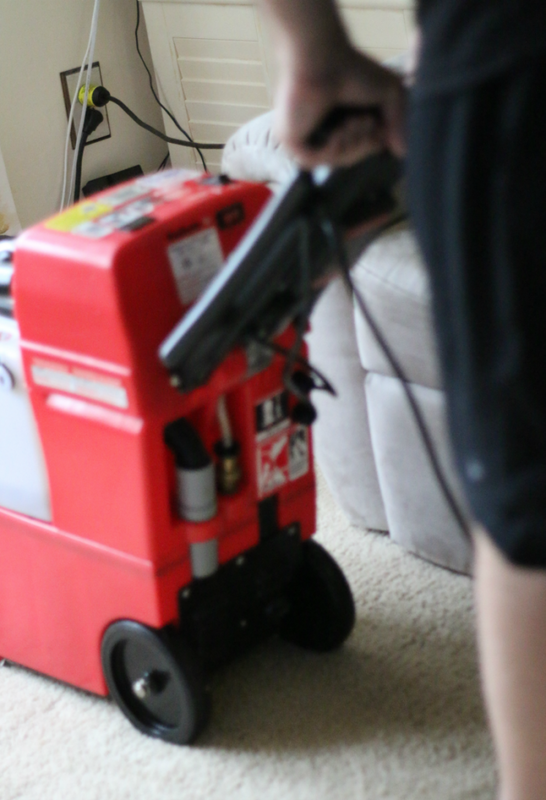 Question: What is the best carpet cleaner rental? Answer. Hands down, in our testing, the BISSELL Rental did a much better job. When we compared one half of the carpet to the other it was clear that the side done with the BISSELL was much cleaner and fluffier and the carpet had a bounce again once dry. While the side done with the Rug Doctor was cleaner than it was originally it was not as clean as the BISSELL side. There was such a difference, in fact, that my husband redid the Rug Doctor side with the BISSELL. 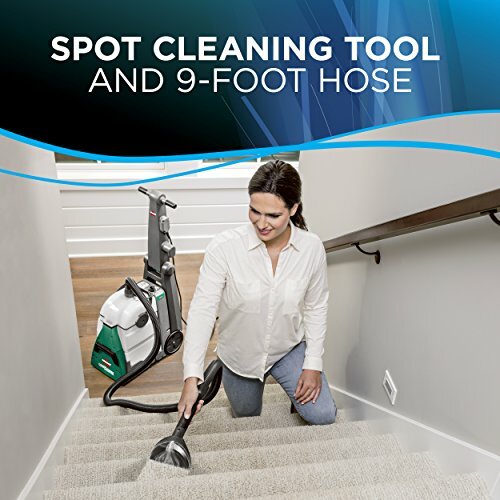 An added bonus of using the BISSELL was that we were also able to do our entryway stairs because of the cleaning tool attachment and they, too, look so much better. I was so impressed with the BISSELL Rental and the next time we clean our carpets that’s what we’ll be renting. 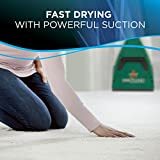 *Since doing this review I have decided that I will be purchasing a BISSELL Big Green for my home it was that impressive. 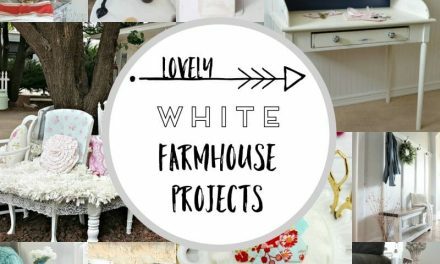 The cost to purchase is not that much more than purchasing a smaller home unit but the results make it worth it in my opinion. 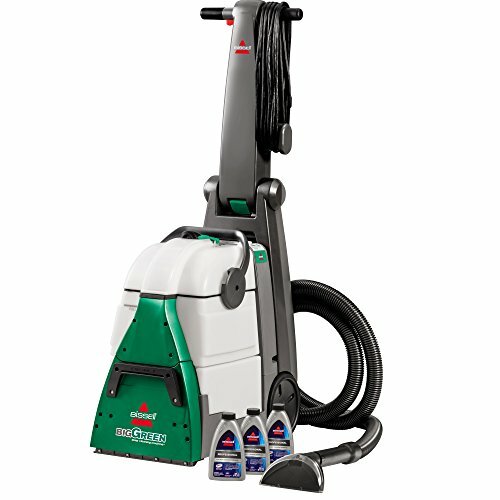 You can rent the BISSELL Big Green at locations nationwide. 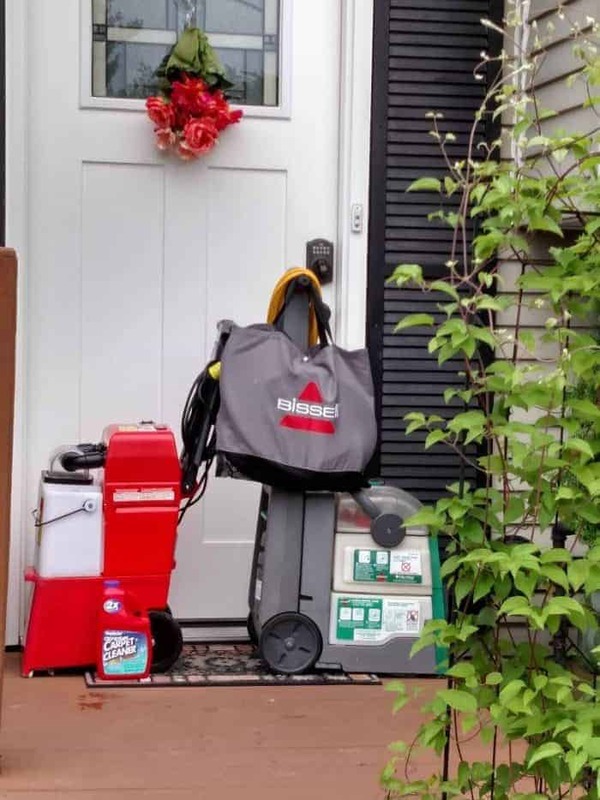 Check out the BISSELL Rental homepage to find a location near you or purchase your own. I found the best prices at the current time (September of 2018) to be from Amazon and you can find that option here. 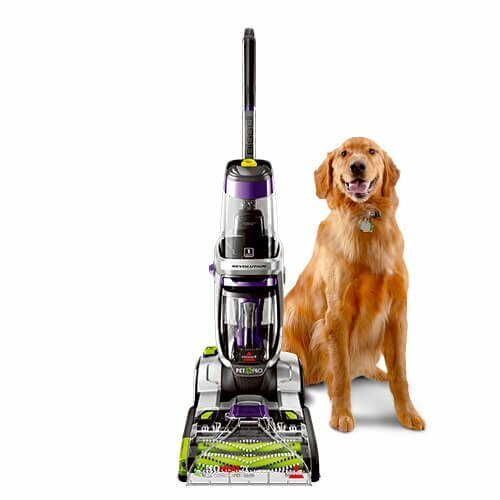 If you prefer to just head to Lowe’s for BISSELL rental, head to the page here and then enter your zip code from the drop down available next to the Lowe’s logo.